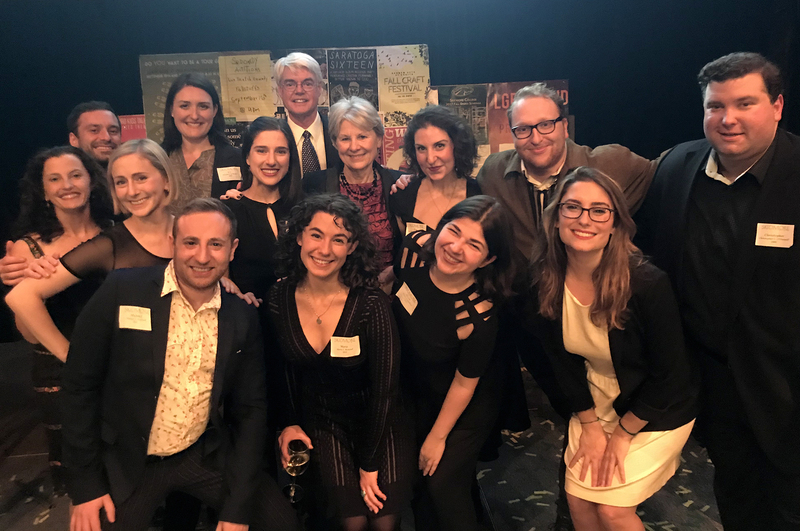 Philip and Marie Glotzbach with Skidmore Theater Alumni at the President’s Society Campaign Launch Gala. Photo: Alexandra Dennis ’18. While some knew each other from their time at Skidmore, others had become friends through Skidmore’s extensive alumni network, and still others were meeting for the first time. In a testament to the strong roots of collaboration, tenacity, and that good old Company spirit that Skidmore Theater fosters in its students, this group of alumni pulled together an opening number in only a few weeks. They performed a rendition of “Magic to Do,” from the musical Pippin, but many of the lyrics had been changed to reference and celebrate Skidmore College. The performance featured actors dressed up as scientists, artists, athletes, and, of course, horseback riders. President Philip Glotzbach himself even made a cameo appearance, soloing a line of the chorus. I had the chance to ask four of these Theater Alumni some questions about their experiences working with each other on the campaign performance, their time at Skidmore, the work they have done since graduating, and what they wished they knew in college. What has your experience been like working on this piece with other Skidmore Theater Alumni? Alissa Alter ’06: Wonderful! We have an amazing network of talented, motivated movers and shakers! I am looking forward to staying in touch with the people I just met and am thrilled to reconnect with old classmates. Alison Schilling ’15: It’s been really wonderful to connect with (in my case) older alumni and get to know what they have been up to since graduation. I barely have a grasp on what I am doing post-grad, so it was insightful to see what they were up to and how they have handled creating art outside the JKB. Also, meeting a whole new group of people that you have things in common with made the rehearsal room so joyous to be in! Michael Axelrod ’11: It’s been a blast! I’m not a “musical” person, but Ryan and Julie have worked to showcase my strengths, and the audience is definitely in for some surprises. I always love working with Skidmore alums, because we all draw on the same theatrical vocabulary and approach to the work. Marie Claire Roussel ’10: So much fun!!! And so surreal. How have your experiences at Skidmore shaped the work you do today? Alissa Alter ’06: During my time at Skidmore, we were challenged and encouraged to take inspiration from other disciplines. This skill at drawing from seemingly unrelated topics and methods has served me well as I both perform and create works in musical theater. As a mostly freelance artist, I also feel that this has helped me weave together a profitable and fulfilling career in theater and teaching. Alison Schilling ’15: Skidmore is really dedicated to making sure that you are a prepared all-around artist, rather than “just an actor” or “just a designer.” I’ve been able to use skills that I learned [at Skidmore] on every project that I have worked on, from the administrative side to the technical side, which is invaluable. It’s also given me a true “go-getter” attitude– the accomplishments that I was most proud of at Skidmore came through being persistent and working to be the best I could be, which was how I’ve gotten all of my projects here in New York. Michael Axelrod ’11: After experiencing the collaborative work environment and consistent professionalism at Skidmore, I always use that as a litmus test for current projects I’m working on. Getting to delve into Shakespeare, Chekhov, Meyerhold, Ibsen, as well as the amazing and broad spectrum of actor training at Skidmore, I feel prepared for a wide variety of work in my professional life. Marie Claire Roussel ’10: Skidmore was invaluable in teaching me how to be up for anything. Saying, “yes, I can do that,” and figuring out how to make it work. Also, I credit Skidmore Theater with giving me a passion for new works, no matter how bizarre; being more open to the avant-garde will lead you to strange and exciting places. What is your favorite project that you’ve worked on since your time at Skidmore? Alissa Alter ’06: Drawing from recent life experiences, I wrote and produced my first one woman show at the Duplex Cabaret in NYC. It was both empowering and terrifying to create my own work. I feel my Skidmore experience prepared me to not only perform the show, but write, edit, and produce it. Alison Schilling ’15: What Makes Us Feel Good, by Brett Evan Solomon. I have been with this play for about two years now, through a reading, a workshop, and a soon-to-be full length run. It’s been wonderful to be in the room with the playwright since the beginning of the process and watch the play mold and grow into what it is now. I’m excited to see a fully realized production of this piece, and be able to explore my character again with some new life experience. If you could give your college-aged self one piece of advice, what would it be? Alissa Alter ’06: Take classes in everything! Take full advantage of the wide range of resources available to you! And use the free studio space all day, every day!!! Michael Axelrod ’11: The journey isn’t as easy or guaranteed as you think it is. But it is much, much more rewarding. Marie Claire Roussel ’10: Oh my god, I could write a novel. Main piece of advice: these four years of your life could lead you anywhere. This is the PERFECT moment to take risks– it sounds cliché, but it’s a cliché for a reason. Go nuts. Rachel Karp is a senior Theater/English major and Co-Editor-in-Chief of the Skidmore Theater Living Newsletter.